Fruit Cheesecake Sampler is rated 4.9 out of 5 by 14. Rated 5 out of 5 by LadyDi from Fruit Cheesecake Sampler I bought the cheesecake sampler for my parents for Valentines Day, and they both loved it. They stated it was the best they had in years! Rated 5 out of 5 by Bopper from Outstanding as usual Must have bought 20 of them over the years and the recipients always say it’s the best cheese cake they’ve ever had. Buy them with total confidence. Rated 5 out of 5 by Maureen01 from Best cheesecake! I ordered the 9 inch Fruit Cheesecake Sampler for friends to cheer them up and they absolutely loved it and said it was the best cheesecake and would definitely order this again. Rated 5 out of 5 by Tmac from Fruit Cheesecake I sent this as a Christmas Gift to my boss & his wife for their holiday party, received nothing but praise about it. Also, sent them the tin of popcorn, they loved that one too. Rated 4 out of 5 by gpnj from Loved the Plain Cheesecake! We loved the plain cheesecake, it was very smooth and tasty! We would definitely purchase this cheesecake in the future, Yum! We also purchased the fruit cheesecake sampler and found the "fruit" dry with a less than tasty consistency as well as the cheesecake being drier. Rated 5 out of 5 by dlmartin from Delicious! I bought this for my son in the military since he wouldn't be home for Thanksgiving. He said it tasted delicious and liked the variety of flavors. 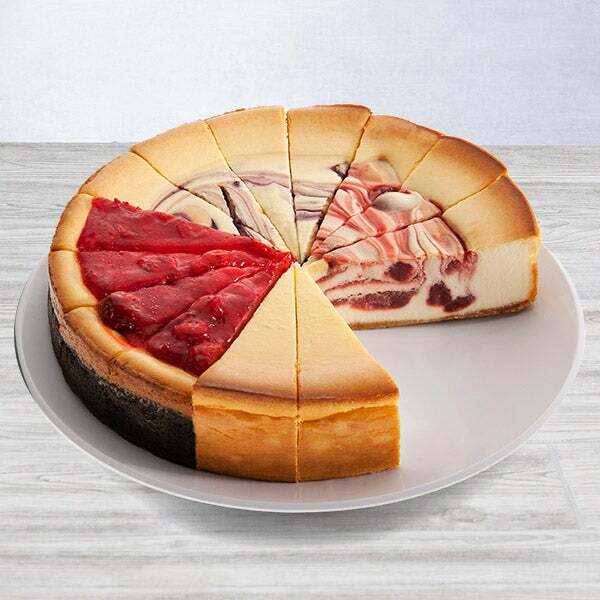 Fruit flavors burst throughout this delicious assortment of our divine cheesecakes. Savory Strawberry, sweet Cherry, and tangy Lemon Blueberry slices make up three quarters of this cake, and the remainder is, of course, famous New York Cheesecake (because some people really don’t like fruity things. And because it’s really good).